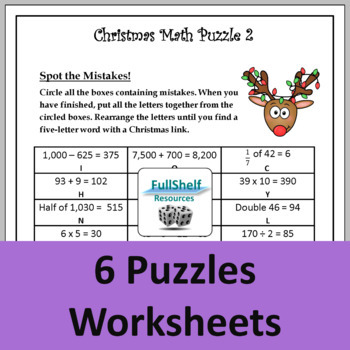 Third and Fourth Grade December no prep math center activities - These end of term printable math review puzzles are engaging alternatives to standard worksheets - ideal starters, early finisher activities, review tasks, or homework. 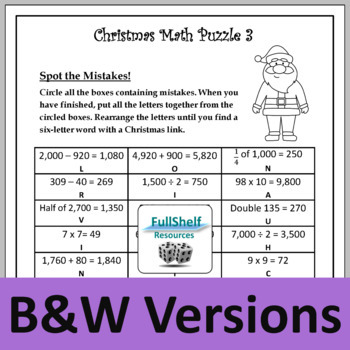 There are three full-page puzzles for fun mental math practice, originally designed for 3rd and 4th Grade but may suit other grades too. Please check the preview to see if the calculations are suitable for your students. 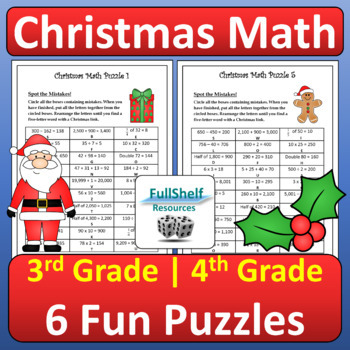 I also have a packet of 5th and 6th Grade Christmas Mental Math Puzzles, and both packets could be used together in some classes for differentiation. Simply print and copy. To use again and again you could place the pages in a dry-wipe sleeve or laminate them and have students complete them using a dry-wipe marker. 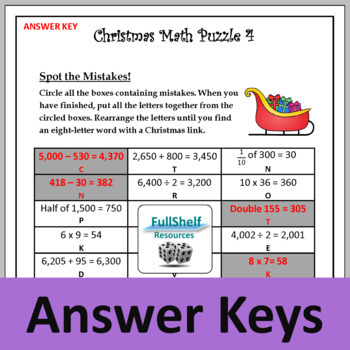 Each puzzle is followed by its answer key, which can be printed for students to self-check or perhaps displayed on a screen to save printing. Hidden Word / Spot the Mistakes puzzles can be completed individually or in pairs or groups. Similar to codebreaker puzzles, a Christmas-linked word is revealed after completing calculations. Each puzzle contains a grid. Within each box is a calculation and a letter. Students circle boxes containing errors. Then they assemble the letters from the circled boxes to find the word. Students often forget or avoid checking their work so it’s great to get them carefully checking in these puzzles. Spotting common errors may help them remember to check their own work. Concepts include: Addition, Subtraction, Multiplication, Division, Times Tables, Doubling and Halving, and Basic Fractions. I hope these activities engage your students. Please do consider rating them on TpT if you can spare a moment. Just go to your My Purchases page and click on the Provide Feedback button next to the relevant purchase. It’ll help my store become a little more established and I’ll be so grateful. You’ll also earn credit to spend at TpT. Thank you very much for your support. Please FOLLOW MY STORE to find out about my new resources.